We all have a healthcare cost â€œwar storyâ€ to tell â€“ usually several â€“ but one area of rising concern is prescription drugs. We seem to be more dependent upon prescription drug therapies than ever before, and many people are on more than one. But like all things related to health care, prescription drug prices are rising rapidly. There are a few ways to fight back at the high cost of prescriptions, and you may find that one or a combination of several of the strategies below will save you a substantial amount of money. 1. Get free samples from your doctor. Anytime you get a prescription from your doctor, especially if it is a brand new one, you should ask for free samples. Not only will this save you money on the initial prescription, but it will also give you a period of time in which to gauge whether or not the drug will work for you. Some doctors will not dispense free samples, but others will. They usually have a supply that has been given to them from the pharmaceutical company as an inducement to use their products. Go ahead and ask, it never hurts. Doctors will usually write something to the affect of â€œallow generic substitutionâ€ on the prescription, but you should inquire about it specifically anytime you go to the doctor. Sometimes doctors will forget, so you should quickly remind him or her. The cost of generic prescriptions can often be just a fraction of what it is for name brands. This will be especially important if you do not have a prescription plan in your health insurance, or if your plan is subject to higher co-payments for name brands. Still another consideration is formulary versus non-formulary. Formulary is a list of medications that are approved by your insurance company. They are medications that will be covered as stated in your plan. However, if the medication is not on their approved list â€“ meaning that it is non-formulary â€“ you will generally pay more for the prescription, and may even have to pay the entire amount. Your health provider should know if a given drug is formulary for your health insurance company, but it may be worth a call to your insurance company or a visit to the website to make sure that it is before going to the pharmacy to get it filled. 3. Find large chain discounts. Large chain pharmacies often offer discounts on prescription drugs. Some of the big box pharmacies are offering $4 generic prescriptions on a long list of medications. But even if they donâ€™t, you can surf around their websites for a while and see what other kinds of offers they have. Targetâ€™s RX Free Card allows for discounts on prescriptions of up to 80% off retail prices for generic drugs, and 15% off the price of brand names. You can get the card free of charge, and that not only covers prescriptions for you and your family, but also for your pets. 4. Buy in larger quantities. A growing strategy to save money on prescriptions is to buy them in larger quantities, and you can usually do this through mail order providers. You can usually save substantially if you purchase a 90-day supply of your prescription, compared to three 30-day refills at your local pharmacy. This is easiest to do with the most common medications, and it does have its limits. If a prescription is considered to be controlled â€“ such as medications for ADHD â€“ you will not be able to purchase larger quantities, nor will you be able to do it through the mail. 5. Get serious about your health. One of the best ways to save money on prescriptions is one of we donâ€™t usually think much about, and that is to improve your health. Prescription drugs often become necessary as a result of neglected health. Poor lifestyle choices are responsible for health conditions in a majority of cases. By making better lifestyle choices, it is often possible to eliminate long-term drug therapies. Many people go on drug therapies early in life, and that results in a pattern of increased dosages and even â€œdrug cocktailsâ€ (multiple prescriptions for the same health condition). This leads to ever-increasing prescription costs. But by losing weight, eating better, exercising regularly, reducing stress in your life, and eliminating habits such as smoking and excess drinking, you will not only improve your overall health, but you could also lessen or end the need for medications.Â Complete elimination of a drug therapy is the ultimate way to save money on prescriptions! 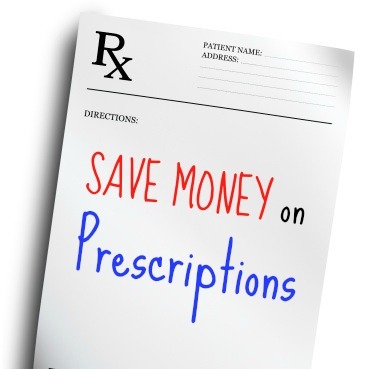 What are you doing to lower the cost of your prescriptions? Leave a comment! Have you had any experience with procuring medication internationally (i.e., from Canada, etc)?